Jeff Smith, the multiple-award-winning creator of Bone, has returned with a new full-color softcover children’s book from Toon Books. 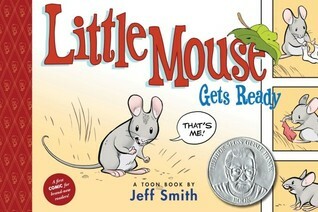 In Little Mouse Gets Ready, “There’s lots to do before Little Mouse is ready to go visit the barn. Will he master all the intricacies of getting dressed, from snaps and buttons to Velcro and tail holes?” According to Amazon, this book has already been given the Theodor Seuss Geisel Honor Award. So how the heck did we miss this one? It came out in 2009!